This healthy appetizer is as delicious as it is beautiful!! 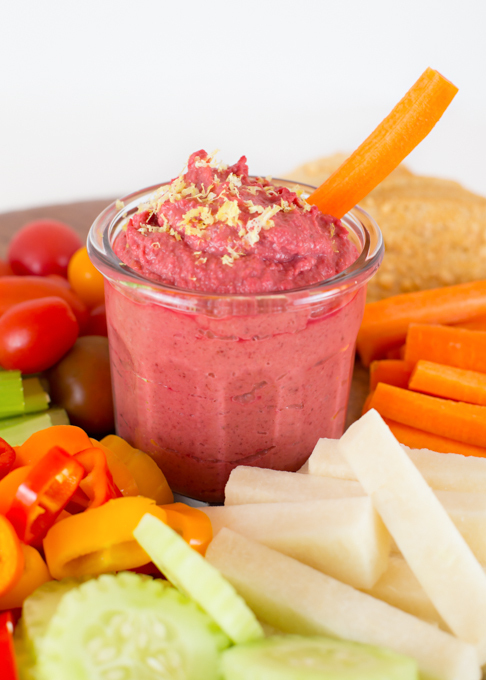 The beets absolutely transform regular hummus into a feast for your eyes! I knew I had to replicate a beet hummus that my sister in law brought as an appetizer on Super Bowl Sunday. She had put together a beautiful tray that included two kinds of hummus, tzatziki, guacamole, crackers, and lots of fresh veggies. 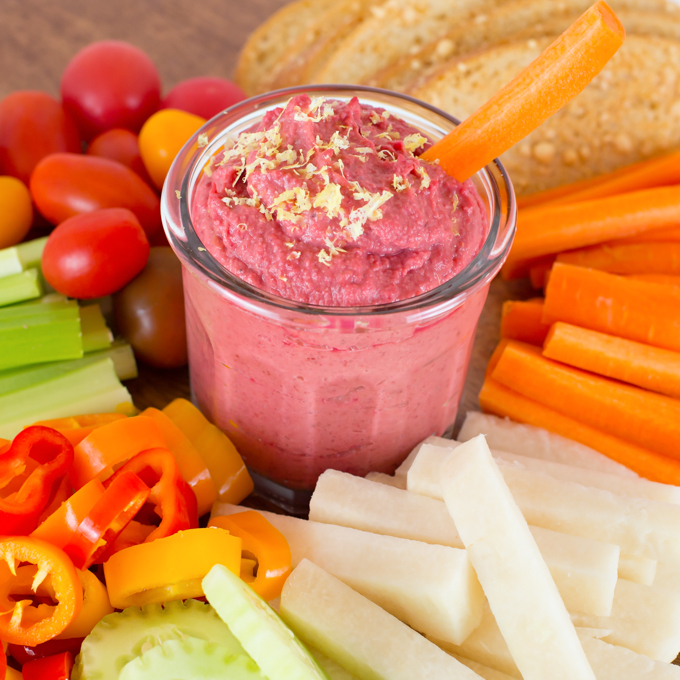 I couldn’t stop thinking about the gorgeous hot pink Beet Hummus! It’s so simple to make, and I made it even easier by taking a shortcut by using TJ’s peeled and steamed beets. I love shortcuts that don’t compromise the quality or flavor of a finished product. Using a food processor, mix all the ingredients together until smooth. It’s that simple! FYI, I ended up by adding in more beets than is shown in this image. Lots of fresh garlic and lemon juice give it a fresh and zesty flavor! 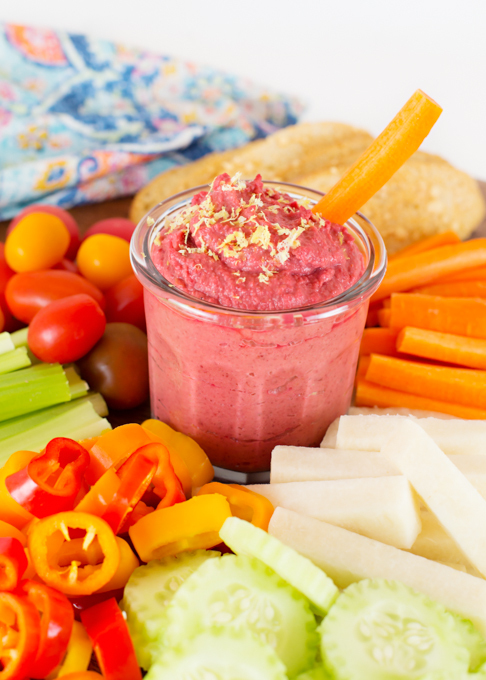 Serve with all your favorite fresh veggies and/or a selection of crisp healthy crackers for a delicious, beautiful, and healthy appetizer! 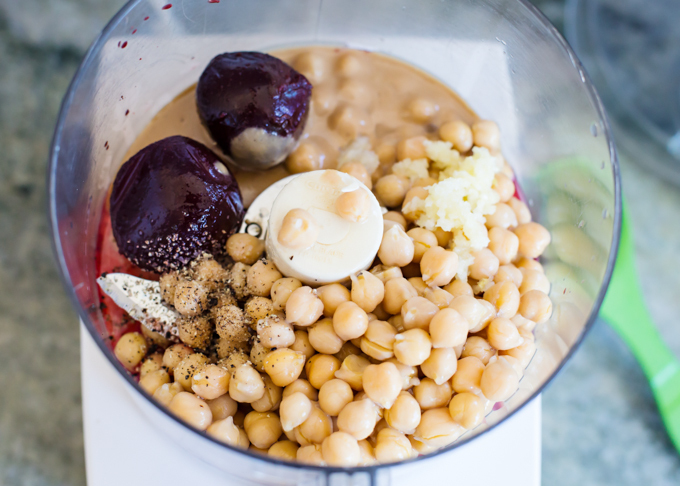 In bowl of food processor, mix together beets, garbanzo beans, tahini, juice of lemon, garlic, salt, & pepper. Stream in olive oil, continuing to blend until smooth. Add additional olive oil if need till desired consistency. If needed, add a little more salt & pepper, to taste. Serve, topped with lemon zest, with your favorite fresh veggies or crackers. Mmmm…I love beets + hummus both of which my husband hate so good for me, I can eat the entire thing myself! Looks delicious, Renee! I have never had beet hummus. The beets add a beautiful color. I have some beets in the refrigerator right now. I’ll have to try it! Such a gorgeous recipe! I love the colour of this! I just discovered Trader Joe’s cooked beets! What an incredible time saver! This recipe would be so cute for a baby shower! WOW! Look at that color! So beautiful! What a great recipe! I love Trader Joe’s so the next time I’m there I’m going to check out their cooked beets! They always have great items there! Look at that gorgeous colour!! I love hummus and will have to give this one a try. Thanks for sharing! 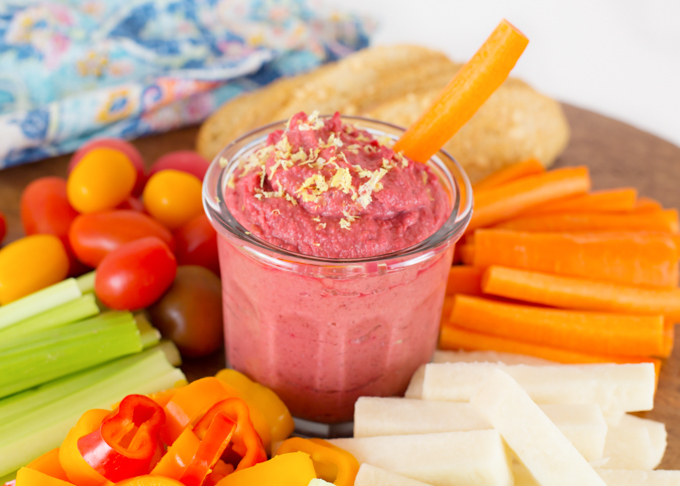 This is a brilliant twist on original hummus — I love the pink tint the beets add! They make anything just a little more ‘pretty!’ and I would have never thought to add them to hummus, but now I’ve gotta try it! Looks great! You’ve inspired me to make my own beet hummus. Thanks!